it almost seems more beautiful to me. the quietness is so good. These are finished softer than yesterday’s. Less about mechanics, more about what it all feels like. Stancions in the silence, anthropomorphic. Beauty manifest, Patricia. Oh your eyes! Thank you, Marjorie. It’s the geometric precision that pulls me in (and makes me climb snow banks) but the exuberance of the red arms seals the deal for me. I have been thinking about these a lot over the last few days. Not sure how one conveys a feeling, but these convey a hostile beauty to me. The wires remind me of the no man’s land surrounding prison camps. 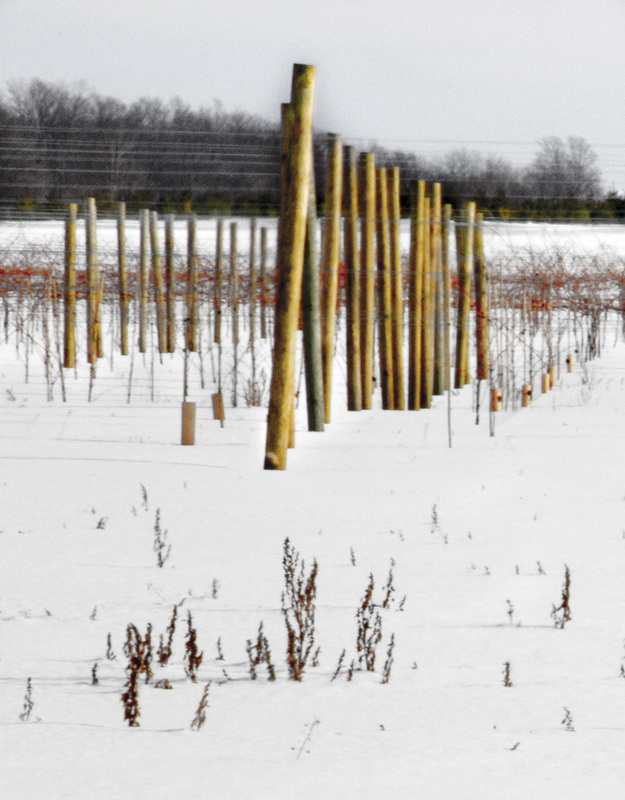 But the snow and vines show nature’s beauty. 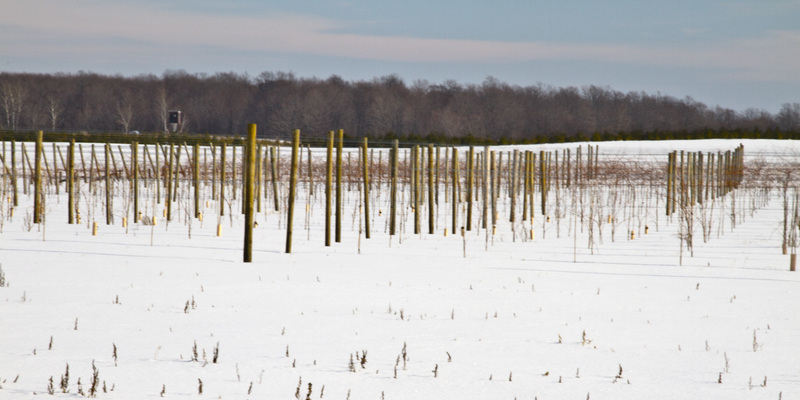 How do they grow vines in such a climate? Much more than that … I’d like to see these printed. Andy…I didn’t answer immediately because I was mulling your response. I would have to say that I would agree with you on all counts–perhaps with different words, but I am there. Re: your prison connection, did you catch the deer stand in the distance in pic #3? I don’t know if you have such things in your part of the world, but here hunters can hide and wait for the deer to come out into the fields. Could certainly pass for a guardhouse as well. What attracted me to these settings is the starkness, the rigidity of lines and, yes, the feeling that humans have imposed a steely grip on the landscape and then vanished, confident that they have bent nature to their wills. For all my mulling, that isn’t a completely coherent answer but I certainly do thank you for sharing your take on these shots and prodding me to express what I was seeing. Ah! I see it in picture #2. Yes!!! !